Do the following for each of the following transformations: 1. Plot the anchor points in the correct locations. 2. 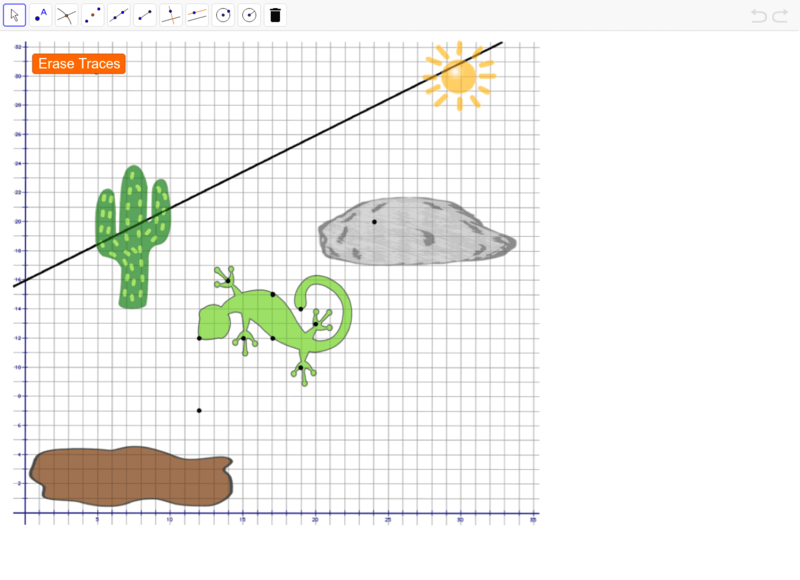 Create a “tool” that will trace the image of the lizard after the transformation. The tool should be a geometric figure such as a line segment, a circle, or some combination of the two, so that when you drag one point on the “tool” around the lizard’s perimeter another point on the “tool” will trace out the lizard in the correct location. HINT: To trace a point, right click the point you want to trace, then select "Trace on." To stop tracing a point, right click the point and click "Trace on" again. To erase previously made traces, press the orange "Erase traces" button. Lazy Lizard: Translate the original lizard so the point at the tip of its nose is located at (24, 20), making the lizard appears to be sunbathing on the rock. Lunging Lizard: Rotate the lizard 90° about point A (12,7) so it looks like the lizard is diving into the puddle of mud. Leaping Lizard: Reflect the lizard about given line so it looks like the lizard is doing a back flip over the cactus.